EdibleCreativity: baby, it's cold outside! Winter chills are upon us here in Coastal Georgia. While trying to keep warm, I am revisiting some old cookbook friends, looking for ideas for quick comfort food. When the icy rain is pelting your window or snow covers the walk, your well stocked pantry pays for itself a thousand times over. Back in the sweltering month of August, in a post entitled, dear diary... the well stocked pantry, I gave some ideas for basic pantry staples. If you, Dear Reader, heeded my suggestions, you are warm, dry and prepared to cook without venturing into the foul weather. Now, if you think of battered, deep fried heaven when I say, 'comfort food,' think again! The following recipes are healthy, but fabulous. With a few changes, they could even feed your vegan friends. For all of you whiners and crybabies who dislike things grown in the ground, remember the old commercial that said, 'try it, you'll like it?' The pizza is like a salad on top of a warm crisp, garlicky crust... what's not to love? Here are a few ideas for a meal using items you may have on hand. You may need to add a few fresh ingredients to round it out. If you can talk your spouse, older child or neighbor into bringing home the extras, you will have a cozy day in! Meal one: Homemade minestrone soup with goat cheese and arugula pizza. 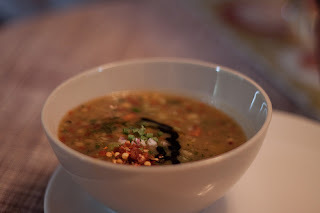 See recipe for minestrone soup in blog post from soup week, zesty beef soup, November 15, 2010. Minestrone is simple and delicious. Chances are you have all the ingredients on hand! Go take a look. Hopefully, you have a couple of frozen pizza doughs in your freezer. Take them out to thaw. 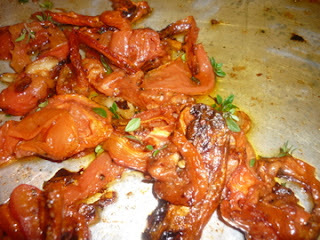 If you have some fresh tomatoes, slice and seed them, placing on baking sheet. Slice some fresh cloves of garlic as well and toss in with tomatoes, then drizzle with olive oil. Season with salt and pepper. Roast in 300 degree oven until soft. Stretch dough until thin. Place on pizza pan or wooden pizza peel. Coat both sides with olive oil. Sprinkle with garlic powder, kosher salt and freshly ground black pepper. Bake in preheated 450 degree oven for five minutes. Lay roasted tomatoes and garlic on crust. Bake five minutes more or until desired brownness. 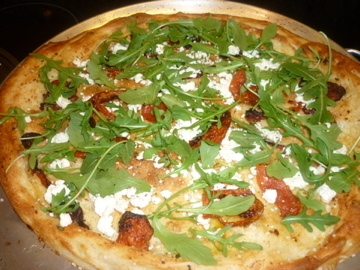 Remove from oven, top with crumbled goat cheese and fresh arugula leaves. Enjoy with minestrone soup. Meal two: Black bean soup with warm, buttered tortillas. In a saucepan, saute half of an onion and a large clove of garlic, minced, in a teaspoon of olive oil. 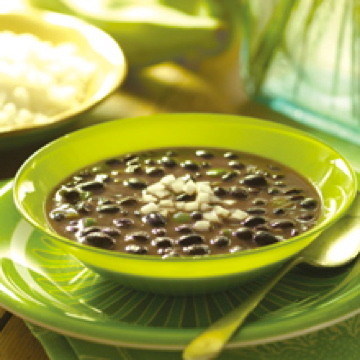 Add a cup of homemade or canned chicken stock, two large cans of black beans and a some freshly ground black pepper. Add a tablespoon or two of red wine vinegar and taste for salt. Season as needed. Simmer for twenty minutes. Warm some flour tortillas in the microwave. Butter each one and fold into fourths. Stack on a plate and keep warm with foil. Serve with a salad. 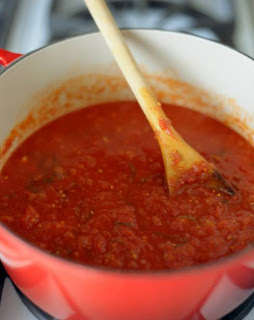 All'-amatriciana sauce is a spicy, meatless pasta sauce that can be thrown together in minutes. Each Italian family has their own version. You can make it to suit your family's taste. If you have a meaty, homemade ragu in your freezer, you can top the polenta with it instead, saving even more time. Take crushed red pepper, a couple of cloves of garlic, a chopped onion and saute them in a little olive oil. Add a splash of dry, white wine, a large can of diced, fire-roasted tomatoes, a teaspoon of Italian herbs, a tablespoon of capers and a few black or green olives, (or both.) Season with salt, pepper and a pinch of sugar. Simmer for 30 minutes. It can be served over pasta or polenta and freezes well. 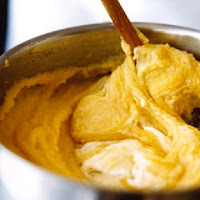 The polenta can be served crispy or soft. If serving crispy, make polenta early in the day. Place in a square baking dish and let it cool. Cut into squares. Fry the squares of polenta in butter until brown and crispy. Spoon the sauce over the polenta on each plate. Serve with a salad.